The House of the Seasons was built in 1872 during the glory days of Jefferson, the largest inland port in Texas at that time. Colonel Benjamin H. Epperson who built the house was a prominent lawyer, political leader, entrepreneur, and confidante of Sam Houston. The house is a fine example of the transition period between the Greek Revival and Victorian styles of architecture. The most unique features of the house are the cupola and the murals. In the cupola, under the picture, each wall contains a different colored stained glass that creates the illusion of the seasons of the year. 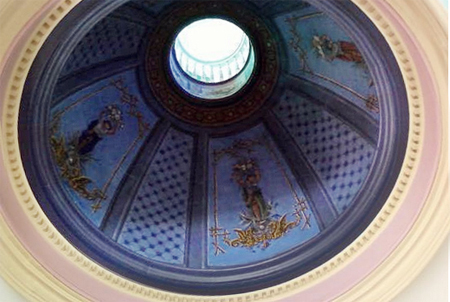 The most interesting interior feature is the dome containing beautiful murals. It may be viewed from the first floor through the well-like opening. The House is decorated to reflect the interior design fashion of the 1870s. Many pieces of furniture are original to the house, having been purchased from Miss Jeannie Epperson, Ben’s daughter, in 1974.